"Adobo from the east and mole from the west, 'al unisono!'" Heat olive oil in a large pot over medium heat. Cook chicken thighs in hot oil until no longer pink on the outside, 1 to 2 minutes per side. Add onion and continue to cook until the onion is translucent, 5 to 7 minutes. Stir garlic into the chicken mixture; cook and stir until fragrant, about 1 minute. Add vinegar, soy sauce, cumin, and bay leaves to the pot. Stir tomato paste and chipotle paste into the liquid in the pot. Bring the mixture to a simmer and cook until the chicken is no longer pink in the center and the juices run clear, about 20 minutes. An instant-read thermometer inserted into the center should read at least 165 degrees F (74 degrees C). Stir arrowroot powder into the liquid at the bottom of the pot; continue cooking until the liquid thickens, about 5 minutes. Bring a large pot of lightly salted water to a boil. Cook rice noodles in the boiling water, stirring occasionally, until cooked through but firm to the bite, about 4 minutes; drain. Ladle sauce and chicken over the noodles to serve. This is a keeper! 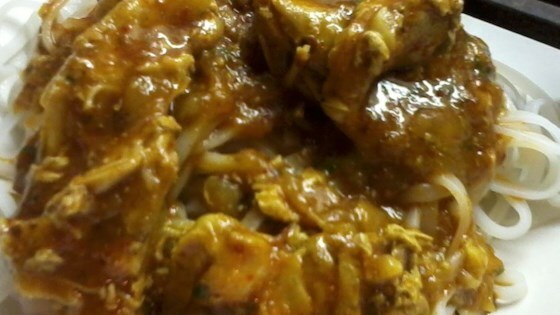 The sauce was thick enough to stick to the noodles without the arrowroot. Also, I used chicken breasts instead of thighs. my husband really liked it. I didn't have to thicken it. There was enough sauce so I added some chicken stock. used bone-in then cut the meat from the bone. Great and super easy! We had to substitute arrowroot with tapioca to thicken which work out good. The whole family, including the kids, loved it.